No summer barbecue with hamburgers and hot dogs is complete without a selection of condiments. These tangy additions add flavor and color to your meal but also play a role in the increase of your blood sugar. As with foods, condiments have a glycemic index that indicates how quickly they impact your blood sugar. The glycemic index of foods, including condiments, lets you know how eating certain foods impacts your blood sugar and overall health. A food's glycemic index ranks how quickly it raises your blood sugar. Foods with a glycemic index of 70 or above are high-glycemic foods and cause a rapid rise in your blood sugar. Those between 56 and 70 are medium. Foods 55 or below are low-glycemic foods, which means they won't cause your blood sugar to increase rapidly. Rapidly increasing blood sugar can lead to short-term issues such as mood changes and long-term illnesses such as Type 2 diabetes. Ketchup has a glycemic index of 55, giving it a low-glycemic ranking, according to the Montignac Method website. Homemade mayonnaise has a glycemic index of zero, but commercial, sweetened mayo has a glycemic index of 60. 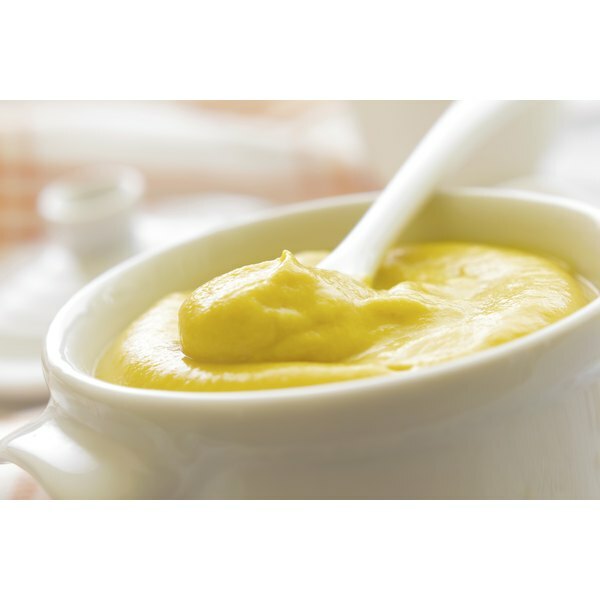 Dijon-style mustard's glycemic index is 35, and sugar-added mustard has an index of 55. The Montignac Method website doesn't provide a glycemic index for sweet relish, but a 2002 article in the "Crossfit Journal" reports sweet relish has a high glycemic index. Sauerkraut has a glycemic index of 15, while unsweetened soy sauce has an index of zero. Vinegar, which you might use to top fries, has a glycemic index of 5. Hummus, which serves as a condiment for Middle East-style dishes, has a glycemic index of 25. Evaluating the glycemic index of the foods with which you plan to eat condiments ensures you take ownership of your diet. If you enjoy condiments on a hamburger, for example, be aware that a hamburger bun has a glycemic index of 61. A kaiser roll has a glycemic index of 73, while white bread has a rank of 71. Other foods that you might enjoy with your meal are also important to consider. Potato chips, for example, have a glycemic index of 51.